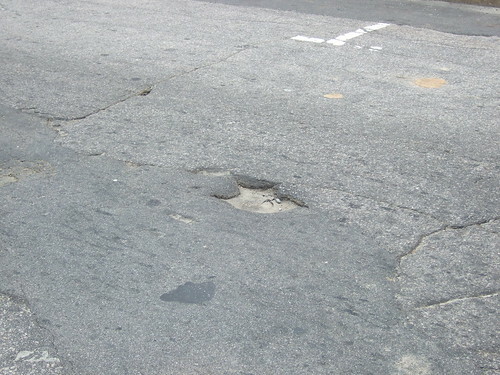 Durham, NC, has the worst, most desperately in need of repair roads in the entire world. Hands down. I will use this blog to prove it. 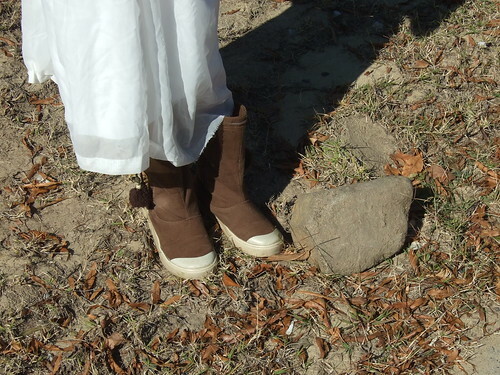 I must apologize for DHTWRITW's recent silence -- all my fault, young Ms. Violet has been diligently documenting the paper mache'd rock collection that is Durham's roads. I, however, have been too busy with what some people call "my real job" (sheesh, some people, don't they read my blog???) to post regularly. I must, though -- however briefly, share some good news. Last night as I made my way home through a relatively mild evening in our fair city with my head full of banjo blues courtesy Otis Taylor and friends (and some killer organization called Duke Performs or something...) and as I pass an unusually dusty (even for Durham) street, I happened to look down the way and see much to my surprise a real live (so to speak) street sweeper!! Wow! 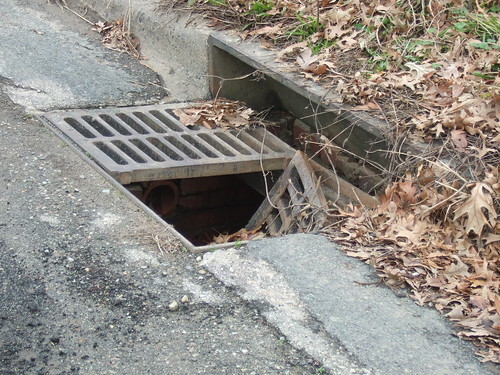 I didn't know Durham had those; I mean -- normally the streets are covered with sand and gravel and newspapers from the 1800s (see paper mache above). But there, last night, in the relatively warm hours of midnightish -- I saw a street sweeper. I'm not going to prevaricate and say that I didn't almost weep -- my friends, I almost wept. Could it be?? dare we dream? that DHTWRITW is already having a positive impact on the decrepit and neglected infrastructure of sweet Durham, North Carolina? 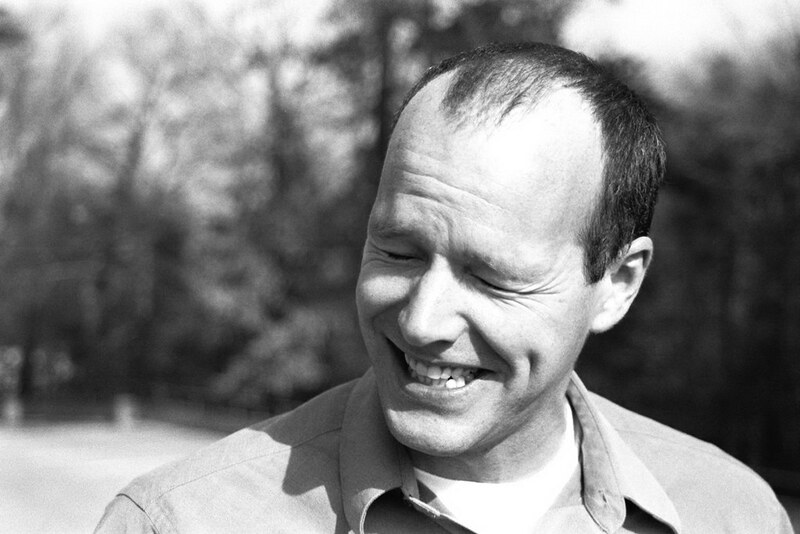 Friends, it is hard to believe but not improbable. At any rate, clearly persistence is the watchword of the day, and in light of that watchword, I bid you goodbye for now and give you this fine Violet Rumble photograph. And that, my friends, could be your first, and last, mistake. What, you're wondering, am I referring to? Is it that big puddle to the left filling a hole that could serve as a quarantine area for some of our larger aquatic mammals? 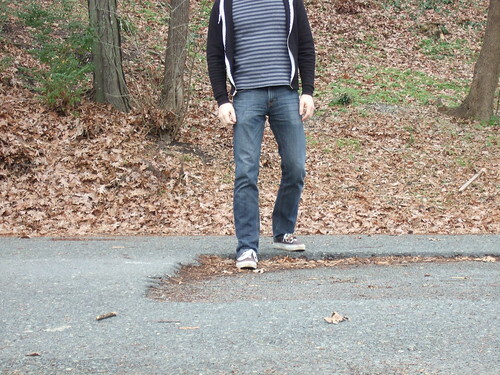 Maybe the jagged line of concrete patches like some ghastly lace-work running along the edge of the road? 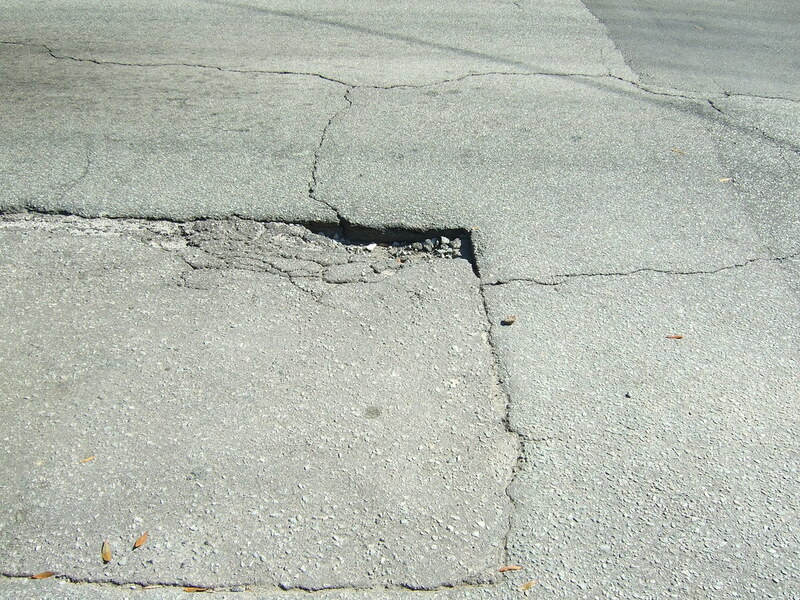 The cracks criss-crossing the pavement? the loose gravel scattered about the gutter? those examples of Durham's famous rocks? The abyss looks back, Durhamites, the abyss looks back! Props to my A1 Peop. This post is dedicated to my favorite wonder bean, Ms. Violet Colleen Rumble(stein), DHTWRITW's chief photographer, my daughter, fashionista extraordinaire, sign-maker, actor, artist, and keeper of Hercules. So I'm not sure that I'll be able to do that every time, so let's just put it this way -- Violet took all the good pictures. All the bad pictures, on the other hand, were the work of yours truly. 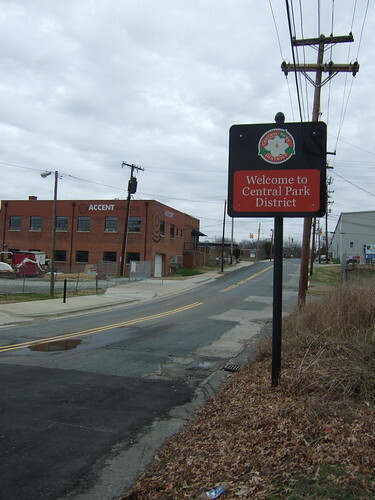 This is the little road that runs off of Corporation up behind the Farmer's Market, and before I go further, I just want to say: "Durham, well done on the Farmer's Market! Little chilly in the winter, but keeps the lines short -- I like it, can't wait to see it in the spring/summer/fall." That is like the gaping maw of the Leviathan just waiting to swallow up some poor, little Kia that's just trying to deliver some fresh cabbage to the market -- why must it be so threatened?? Particularly this road is regrettable in light especially of the wonderful farmer's market it purports to serve. And I'm going to have to set aside more than a few moments at lunch time to deal with Foster Street. In any case, if it is not already abundantly clear, DHTWRITW would be a sad, sad, example of the simple-minded obsession of one clearly deranged man if it weren't for the fine work of one amazing 9 year old. Thanks, honey. But I, unfortunately, am not talking about rock and roll music. I am talking about rocks. Stones. Boulders. Pebbles. In short: Rocks. 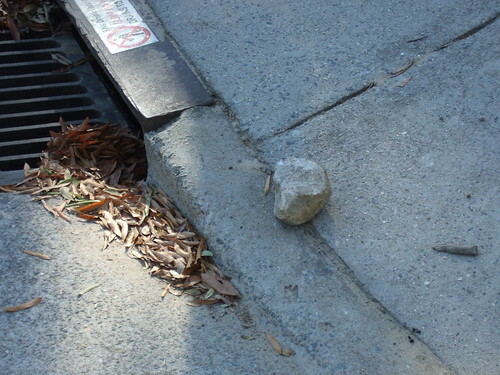 All over Durham -- more than any town I've ever been in, and by a wide wide margin -- there are rocks just lying around. Big rocks, little rocks. Just rocks. All over the place. Take a look at the photo above? See that one to the left of the strip mine masquerading as a road? That thing was just sitting in the middle of the road a good several inches larger than my fist. It was a big damn rock. And that's just the beginning -- does Durham have some bizarre magnetic force that draws meteorites to our fair burgh? I mean, we're not living out in the woods, right? This is a fairly good-sized city, and it's just covered with rocks. Aren't there machines that like sweep up the roads or something? Do we not have those around here? I mean, where, exactly, are these rocks coming from? Welcome to Durham Has the Worst Roads in the World where I will document--in painstaking detail and at the risk, at times, of my own life--how awful the roads of otherwise quite charming Durham, North Carolina, truly are. I will document this awfulness with words, moving & still images, and--at times--recorded sounds. Since the roads here are so bad and there are so many of them, I trust I won't run out of material any time soon. A eternally insufficient thank you to my trusty, invaluable, talented assistant, Violet Rumble, Durham Has the Worst Roads in the World's chief photographer. 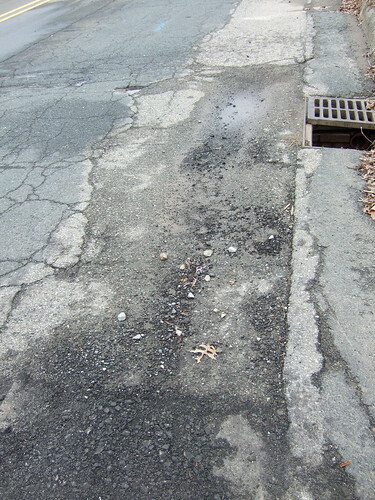 Why, you might ask, am I going to the trouble of documenting Durham's terrible roads? Because they are terrible. The picture at the top of the page would be called "just the beginning" usually, but how does infinity have a beginning? at what point does the universal have a middle? at what dark wall do you find yourself at the end of "everything"? 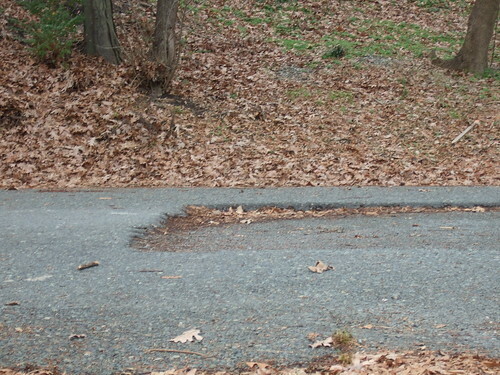 What I mean to say is that that pockmarked crater, gaping gravel filled pit is a small, small piece of a web of truly terrible roads that make life in Durham, North Carolina, significantly worse than it otherwise would be. I want to make it clear, despite all this, that I find Durham an extremely pleasant place to live; the people are friendly, it's small enough to feel comfortable, but large enough to get lost in, and beautiful old brick buildings--once tobacco warehouses--lumber block after block. I am a happy Durham resident whose happiness could reach ecstatic levels with a little effort on the part of the Street Maintenance Division of the Public Works Department. 600 or so block of N. Duke Street.